A young boy named Joshua and his kind of crazy family take a trip to the country to partake in some old-fashioned country livin'. Of all the places in the country they decided to go to the small town of Nilbog, population 26. Little do they know that Nilbog is not your typical hospitable small country town... as Joshua's dead Grandpa warns him, Nilbog is the kingdom of the GOBLINS!! I almost don't have to review this movie. It's got its own little (actually sort of massive) cult following. People have described it as The Rocky Horror Picture Show of the 21st century. And there are in fact sold out show where people get up in front of the screen and act out the best parts of this movie. So there you go, pretty similar. So I could review this movie like every other person on the planet and tell you how bad the acting is, how cheesy and unintentionally hilarious the whole thing is. But I won't do that because I legitimately enjoy this movie on many levels and yes, I even respect the work everyone put into it. Troll 2 was meant to be a horror film for kids, like Gremlins or (for slightly older kids) Ghoulies. It's one of the few PG-13 horror films I can stand. Let me tell you this, if the current crop of PG-13 horror flicks were more like Troll 2 and less like The Grudge or what have you I would be going to the movies all the time. So, when you watch Troll 2 as an adult you have to sort of force yourself into the mindset of a little kid (not hard for me). Sort of like when you are watching The Neverending Story or Return to Oz. From the point of view of a little kid, I think Troll 2 is pretty terrifying. There are parts that are even a little creepy for an adult. Troll 2 is pretty competent on most levels. I'd go so far to say that the direction is tight and the lighting is great. The acting... okay, the acting is bad. But again, look at it from the point of view of a kid. Kids are stunted emotionally and haven't had time to fully mature their feelings. The only things they understand are extremes... people yelling, people being scared, people laughing. The audience this movie was meant for simply wouldn't even appreciate excellent acting. So why spend the money on pros? Having said all that, the acting is not so bad that it actually detracts from the movie. For an example of that watch any Japanese movie made in the last 10 years or so. Troll 2 also has a really cool script. There! I said it (actually, I wrote it, but saying "There! I wrote it!" sounds awkward)! I don't care what anyone says, there are some cool things going on in this movie. The goblins are vegetarians so before they can eat you they have to trick you into eating magic goo which turns you into a plant. The goblins even have their own little religion, and some kind of hierarchy, with a priest goblin near the top and a queen over all the other goblins. If you stop and think about it, a lot of thought was put into this kingdom of Nilbog. Now, I could do the thing where I list off a bunch of hilarious moments from this movie but I won't do that either. Like Story of Ricky, Troll 2 is sort of a set piece movie and I would hate to ruin any of the fun by giving away my favorite parts. This is a great comparison, now that I think of it, because both movies are also the kinds of films where every minute seems to top the previous minute in terms of sheer wackiness. Troll 2 seriously never lets up. It's an awesome ride from T2-0 (the beginning of the movie) to T2-95 (the ending). I will discuss, however, some things that people don't seem to go into in their reviews. 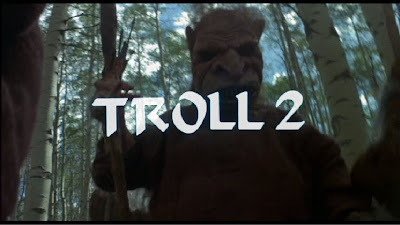 For example, we know that Troll 2 was meant for kids. Why then are there so many blatant sexual jokes? Why is there a scene where someone is seduced by an evil witch provocatively wielding a corn-on-the-cob? We know that the script was written by Italians (always an extremely good sign, if you are familiar with Italian exploitation movies). How much of the awkward dialog is a result of this, and how much is a result of having a bunch of amateur American actors being directed by an Italian guy? So, I suggest you give this movie a watch. Unlike most "good bad movies" it's not only fun if you are drunk. I've probably seen it about six times and I never get sick of it.